Toyota will continue the growing trend among auto makers of announcing new models and concept cars at places other than auto shows by unveiling the GRMN Sports Concept II at the NÃ¼rburgring 24-hour race this weekend. 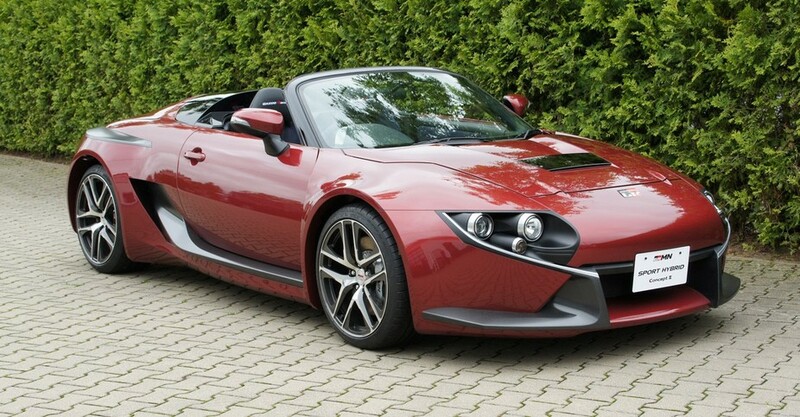 The GRMN is a lightweight, petrol-electric hybrid convertible with 295 bhp. The 245 bhp V6 is located centrally and drives the rear wheels while the front wheels are electrically-powered to complete the sports-hybrid AWD system. The customary bizarre Japanese concept name of GRMN is derived from "GAZOO Racing tuned by Meister of NÃ¼rburgring", which in turn means that it is the product of a vehicle development program created by GAZOO, while the "Meister of NÃ¼rburgring" refers to the late Hiromu Naruse, the head of GAZOO Racing and a Toyota test driver. The GRMN SPORTS HYBRID Concept II is a revised version of a petrol-electric sports concept shown at Tokyo Auto Salon last year. The GRMN's sports-hybrid AWD system is claimed to improve stability and maneuverability, while increasing driving enjoyment.